Ever wondered how car dealerships manage to get the actual cars inside their respective showrooms? Well, for the most part, they are driven it, via carefully hidden doors, occasionally via lifts, or through large sliding partitions of glass. It's those panes of glass, unfortunately, that have come off second best here. A young woman was shopping for a new Hyundai with her parents in northern India last week when the dealership owner's worst fears came true. 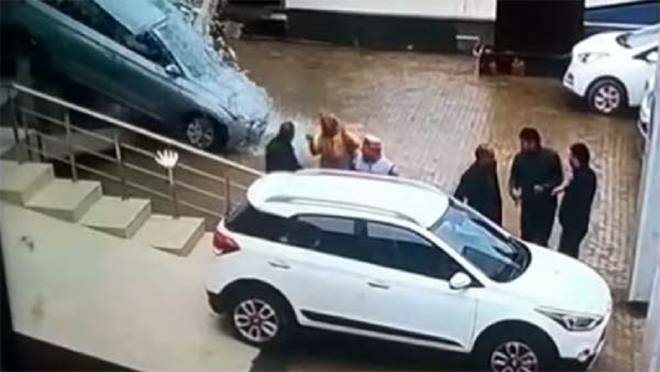 The circumstances around the incident are equally unclear and pretty damn obvious - salesperson invites the lady to step inside the car - an Indian variant of the i20, by the looks - and by invitation or accident, the lady starts it. For reasons only known to the lady, she decides to then pin the throttle instead of the brake, and the small hatchback surges forward, smashing through the tall panes of glass, leaping down the 1m high ledge and careening into two parked cars on the forecourt. Amazingly, she's missed everyone outside the dealership and emerges from the now distinctly second hand Hyundai shaken but unhurt. The insurance bill for this one will be a doozy... and I'm not sure she'll get free mats thrown in, either.